and the cheesier the better in my book! i made up these little labels in photoshop. to help make it as easy as possible you can download them here. i took a 12×12 sheet of paper and cut it down to 8.5×12 so it would fit in my printer. then i cut out each tag according to how i wanted to use it. i used a 3″ circle punch on this one. please get a coupon and go directly to your craft store and grab yourself one. backed it in a 4″ scalloped circle. 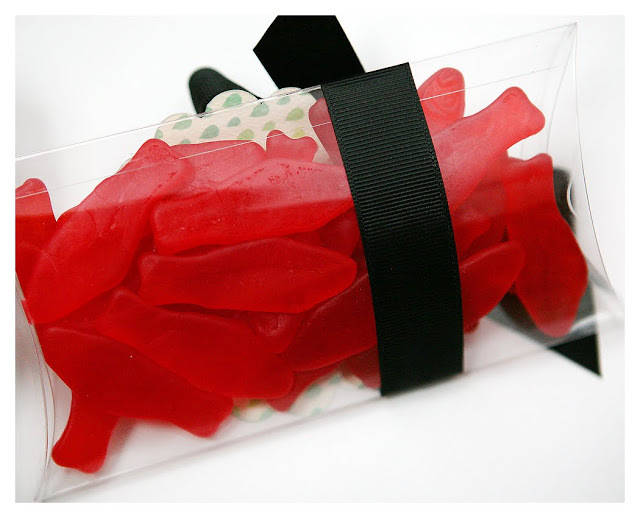 i used ribbon to tie it on a box of swedish fish. of course you could put it directly on a bag of swedish fish you grab at the store. or even a package of goldfish crackers. 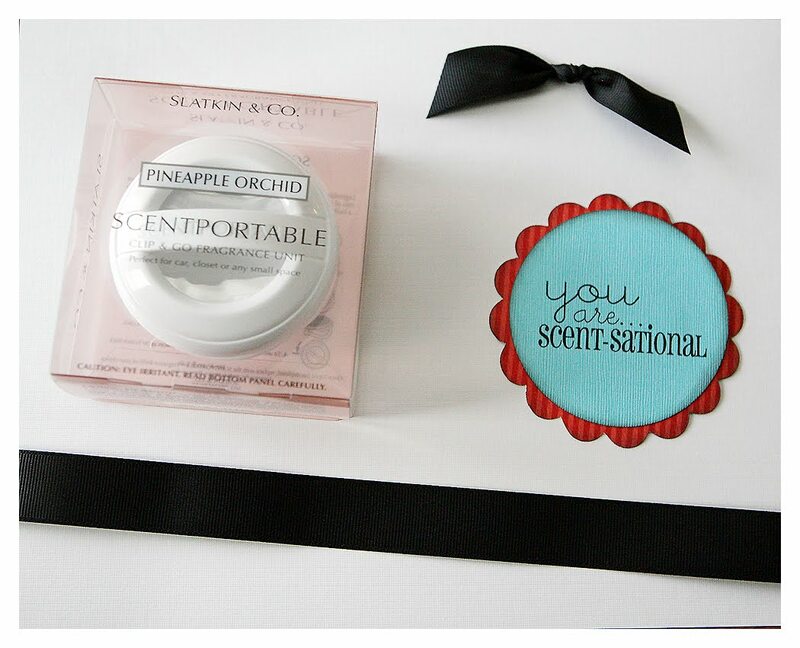 you could use this one with any smelly gift. a candle. car freshener. pretty much anything bath and body works sells. 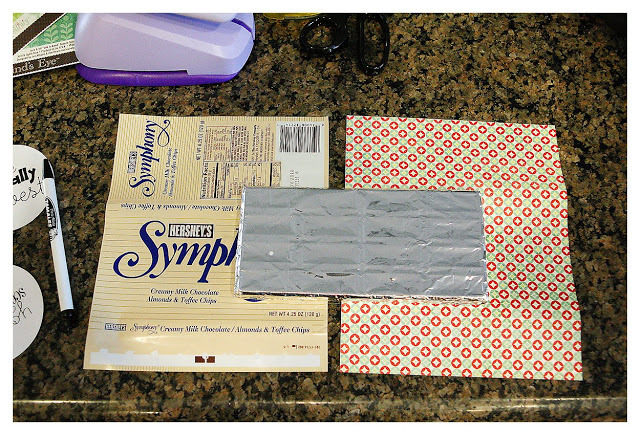 carefully remove the wrapper off your chocolate bar and use it for a pattern. wrap your new pattern around the chocolate and use some glue dots to glue it in place. cut your tag out and punch a hole in the top corner. grab some ribbon and tie a bow. easy peasy. i cut this label into a tag shape. put some chocolate in a bag… and tied it all with a bow around the top of one of the bottles. hope these ideas come in handy!! So cute!! You are so creative! My hubs and I will be visiting Vegas next week. 🙂 When I get home I'll be purchasing a circle punch! Great ideas! I might be using these for my kids' teachers!! These are so cute. Love them! Thanks for these great ideas! They will come in handy as we near the end of the school year! Hello! We are crating treats for 65 teachers (the hole staff)> Wondering if there is a way I could get just one phrase on a sheet multiple times? Does this make sense? 🙂 THANKS! so cute – thanks for the ideas. i will be using some of these next week. also, what size of circle punch are you using? oh, just kidding (ha ha). i see you have already posted that. Those are adorable! 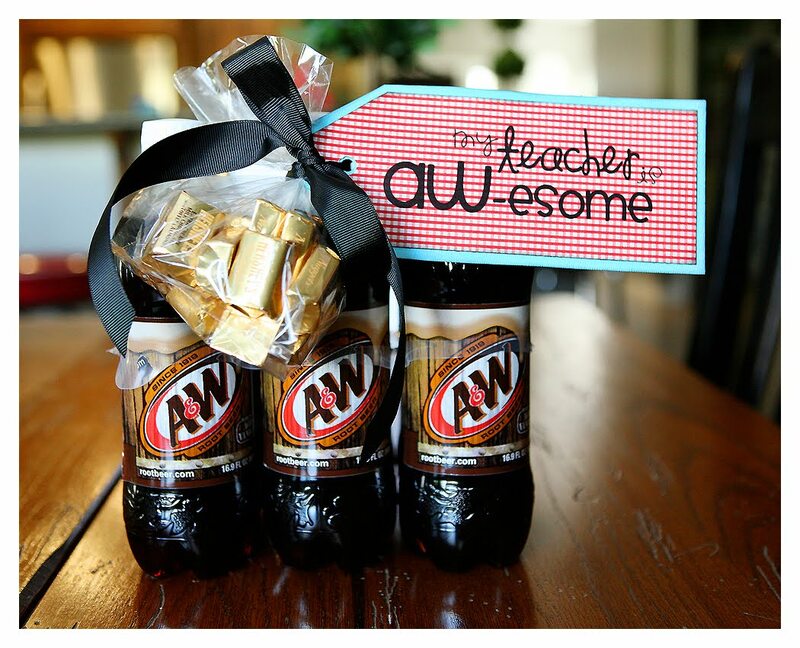 I am thinking of using the A&W idea for the many many graduation gifts we need to give this year. You are AWesome Graduate! Oh I just realized that you photoshopped those tags. You are amazing. Aren't you just dying to make some graduation tags? Please? Such clever ideas!!! As a retired teacher, I would have loved these gifts!!! I LOVE these!!! So awesome! Thanks for another great idea and download! i am all about the cheese factor. i love these and will definitely be using them! thanks! love it! Levi's teacher will be getting a scent-sational one! thank you! 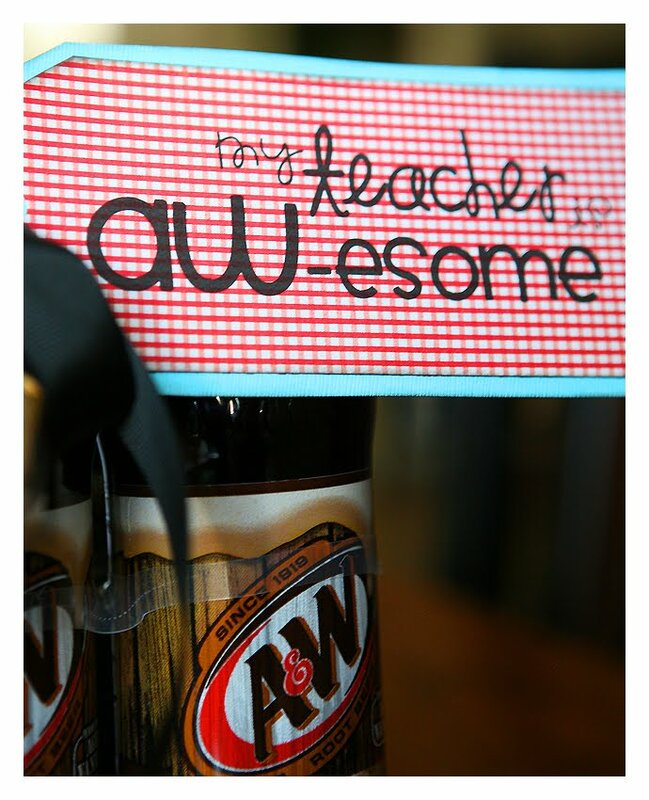 As a teacher, I have to say that I love your teacher gift ideas. They are cute, enjoyable and expression appreciation. Yet they don't have to stay around forever! Love your blog. Thanks for sharing your creativity. I check your blog daily…love it! I love quick and cheesy too!! The more "cheese" the better! OOps! I absolutely love these teacher's gift ideas. Will come in handy in about a week! Thank so much. Thanks for sharing your cheesy treats. I love them. You have the best ideas. Just wanted to take a minute to thank you for taking the time to share all of these fun and stinkin' cute ideas. I've used several and shared them all with friends for their schools. I love that you are willing to share your talents! Thank you! I just found your blog and love it!! 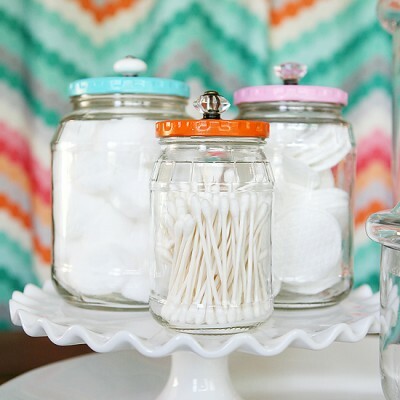 You guys have such fantastic crafty easy ideas! Thank you for sharing! LOVE! LOVE! All your ideas. I have done every single one of your projects, except for the frame one. Just haven't found the need for it yet. 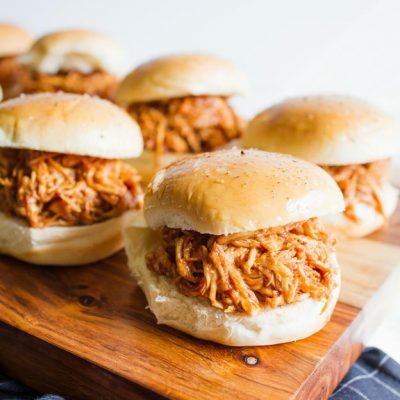 Keep these easy, cheesy, ideas coming! Thanks a whole bunch. These are super fabulous! So creative and adorable! Would love for you to stop by the Sunday Showcase Party if you get a chance. Hope you are enjoying your weekend! Thanks for sahring the great printable! I just bought a 3" circle punch so I would love more "cheesy" tags that work with the 3" circle! (Generic ones that could be used in variety of situations….) THANK YOU! Love your creative talent! These ideas are amazing! I wish I had kids just to do some of these projects. . . but I guess most of them could be used for pretty much any appreciation. you are amazing! I love your style. I love cheesey too! Thanks for sharing! Thank you so much for these great ideas! I'm doing the A&W and the candy bar this week. So cute! Thank you so much for these great ideas. 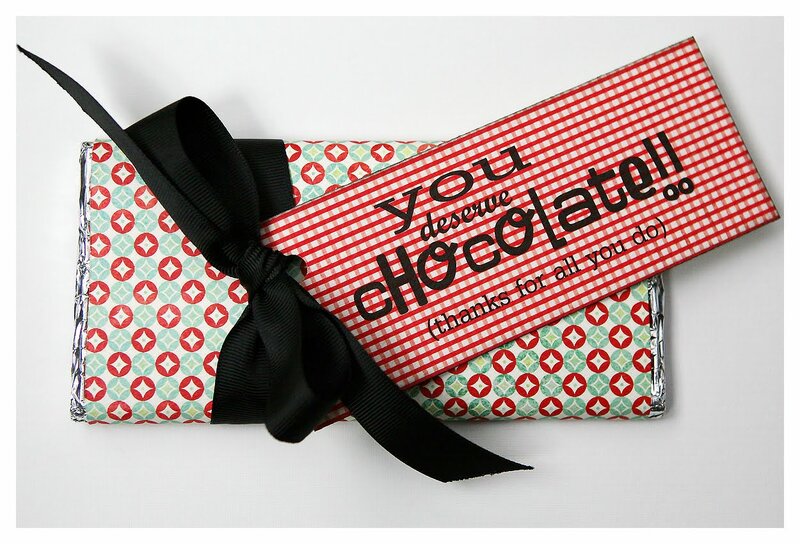 Because of you girls my kids' teachers will be getting chocolate bars all wrapped up pretty tomorrow. Thanks! I just came across your blog. And I'm kind of in love! Is that okay? How amazing is your eye for awesome cuteness? Really. I'm loving just letting my eyes take it all in! Thanks. I'll be bookmarking this for SURE! sooo cute!! Can you share which fonts you used? These are so much fun! You gals are clever. My friend just directed me to your blog and I love your work. Thank you for sharing! 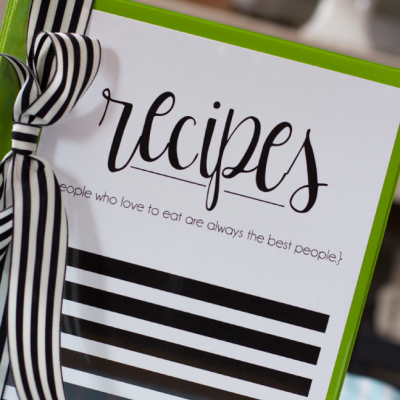 The fonts used on these projects are adorable! Are you willing to share what they're called and where you found them? Thank you! I love quirky and these are great, too bad I'm no longer in the education profession or I'd be putting them to work for my former colleagues. However, I saved them to use them for church thank you's, that always seem to crop up! AW-some!! My soda-obsessed kindergartener is going to be giving some of these away this year! AW-some! My soda-obsessed kindergartener is going to be giving some of these out this year! 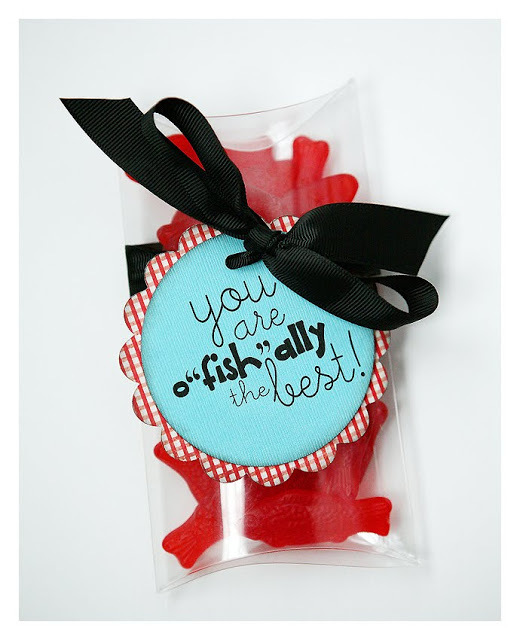 Would you please share the fonts you used for your swedish fish tag? Great & ADORABLE ideas! I'm stealing the A&W idea for Valentine's Day! Thanks for sharing!!! 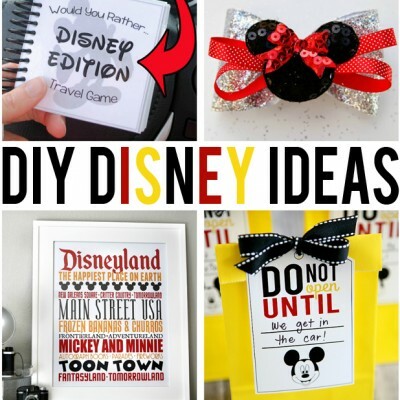 Just wanted you to know I linked to this post because I wanted to share your cute ideas with others. Love your site and so appreciate all the creative juices that flow over here!! Thanks for sharing! I love that I just have to print and cut and I'm all set. I'm a big fan of simple and cute. Okay this is just too adorable. Great idea and so creative. This helps me a ton to get out of my usual teacher gift rutt of candles and Starbucks gift card. Thanks for sharing. 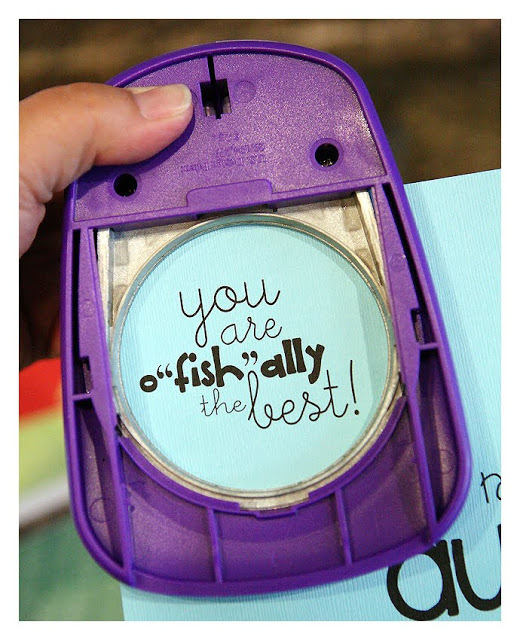 I love these ideas, but I am so frustrated…I can't find a 3" circle punch or a 4" scalloped punch anywhere! I have checked Hobby Lobby, Michaels and scrapbooking stores. Where can I find them or am I mistaken on what I will need? Thanks! I love all of these. Perfect for my crafty classes my shop hosts. Where did you find your 4" scalloped punch? I can't seem to find one that big. Thanks for the cute ideas!!! Thank you, thank you, thank you, I was JUST asked to head up a group of mom's to do small gifts every day for a week during teacher appreciation for over 70 staff members at my daughter's school! This will make it super easy!!! Love your ideas! I posted a link on my blog! Thank you so much! 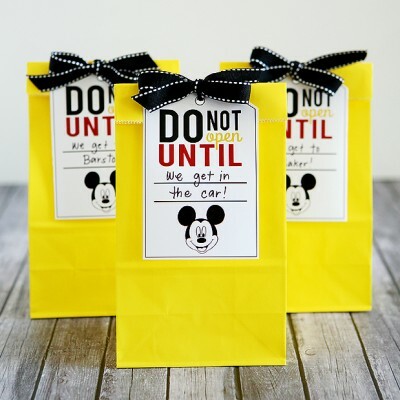 So cute, and I love how easy these are. Thanks for sharing! 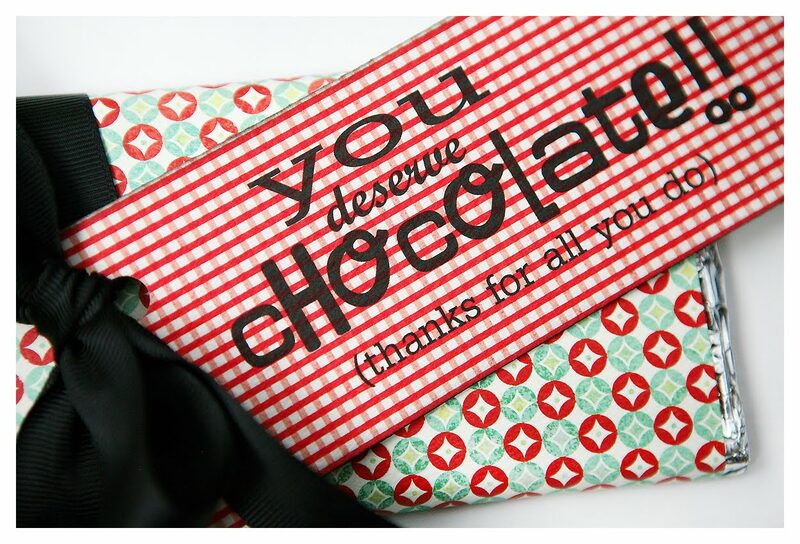 Loved the candy bar wrapper! Although I just covered the Hersey wrapper with the paper… Thanks for the great idea; my kids' teachers loved it! These ideas just saved the day! Thank you! These are great! What are the fonts you used in the o-fish-ally label? 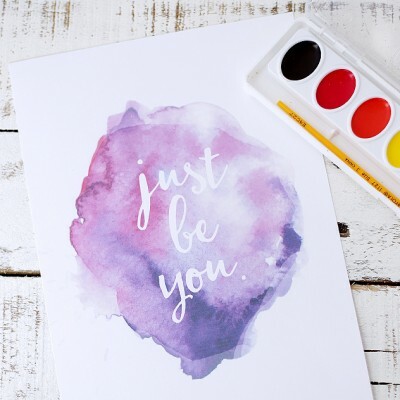 Thank you so much for the free printable!! All these ideas are so cute! The download is no longer available! 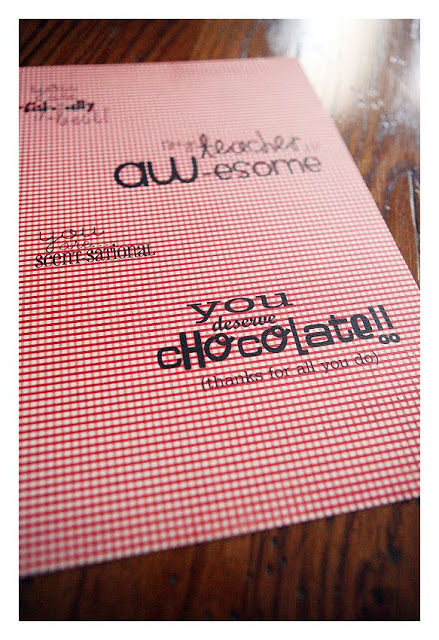 Would love to use this for upcoming Teacher Appreciation Week.